From Guglielmo Marconi’s earliest successful radio demonstrations, which consisted of point-to-point sending of telegraph signals in Morse Code, it was clear to many that radio should be a broadcast medium. That is, rather than two people using it to talk back and forth like a telephone, one person could send out a signal that could be heard by many, like an actor speaking lines in a big auditorium. On Christmas Eve 1906, Reginald Fessenden broadcast a program with speech and music to an audience of amateurs and ship radio operators who had been previously alerted to tune in. Subsequently, many amateurs would broadcast entertainment and news, either by telling their friends in advance or just sending it out on the airwaves and letting it find whoever happened to tune in. During World War I, these amateurs were asked to suspend their operations, but many went back on the air in 1919. The sophistication of radio equipment and the number of amateur operators grew rapidly. One of these amateurs was Frank Conrad, an engineer in Pittsburgh with particularly sophisticated equipment, thanks to his technical background, and with the call sign 8XK. When Conrad began to transmit music played from phonograph records he got so many individual questions and requests, that he announced he would broadcast on a regular schedule. The response was so positive that the local merchant who was selling him the records agreed to supply them for free if Conrad would mention his store on the air. A local department store learned about the popularity of this program and started advertising radio receivers not to be used for point to point “ham” radio, but for listening to Conrad. Then the manufacturer of the radio receivers, Westinghouse, which happened to be located in Pittsburgh, heard what was going on. They decided to build a broadcast station at their plant and operate it every night with an advertised program. They thought it would increase the sales of their receivers and be good publicity for their brand name. 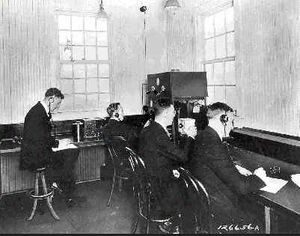 On 27 October 1920 they were granted the very first US broadcasting license to operate the station with the call sign KDKA. It was just like a regular ham license, but given to a corporation rather than an individual. The concept of the commercial broadcast station did not exist yet, but it soon would. On 2 November 1920, presidential election returns (Warren Harding vs. James Cox) were telephoned from the office of the Pittsburgh Post to KDKA. Someone from the Westinghouse information office read them into a microphone; in between, music from a phonograph was played into the microphone. Large numbers of people tuned in. Harding won the election, and modern radio broadcasting was born. This page was last edited on 17 September 2015, at 15:30.